Danbury, Conn. – July 20, 2016 – Stew Leonard’s has been serving up farm fresh food to families since 1969. While the family pup certainly enjoyed the occasional table scrap of Stew Leonard’s NAKED beef as well as tasty pre-packaged treats that are stocked on Stew’s shelves, there have been limited options to fresh dog treats were made in-house. Now, with the introduction of Bubba’s Barkree, even man’s best friend can enjoy the same fresh-from-the-farm goodness that shoppers have come to expect from Stew Leonard’s! Stew Leonard’s Team Member Barbara Bucknam, a passionate dog lover and avid baker who joined the company’s bakery team more than 30 years ago, knew that Stew Leonard’s shoppers were animal lovers and they – like her – wanted to give their dogs the best. She was encouraged by the Leonard family to combine her two loves and develop an all-natural line of baked dog treats. 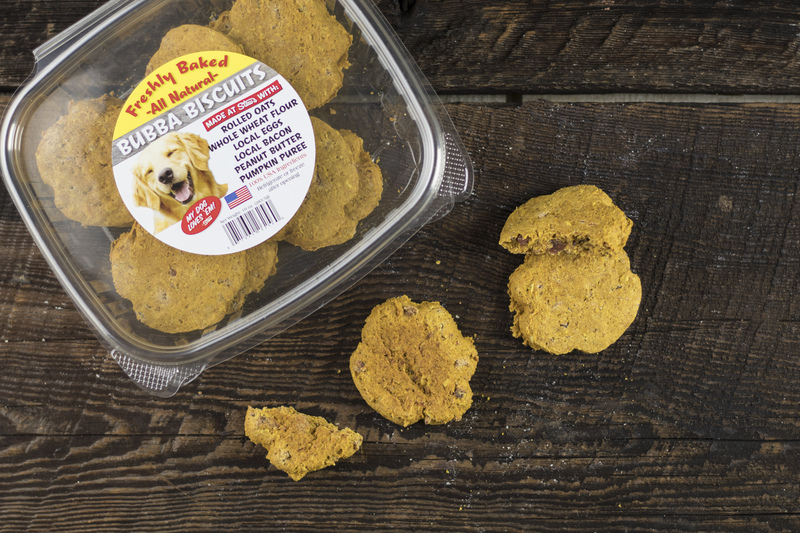 Using some of her favorite recipes for homemade treats that she makes for her own dogs, Bubba’s Barkree was born! The entire line is baked from scratch fresh daily using all-natural ingredients in Stew Leonard’s very own bakery department. There is not one ingredient in these treats that Barbara or Stew Leonard Jr. wouldn’t eat themselves! Bubba Biscuits: The original! Baked with rolled oats, whole wheat flour, eggs, bacon, peanut butter, and pumpkin puree. Bubba Corn Dogs: A Stew Leonard’s all beef hot dog cooked and wrapped in a pastry of sweet potatoes, vegetable oil, Stew’s buttermilk, eggs, corn meal, and brown rice flour. Made with Gluten Free ingredients. Bubba Snacks: Made with whole wheat flour, rolled oats, sweet potatoes, peanut butter and eggs. Bubba Pup-Cakes: Baked with whole wheat flour, eggs, rolled oats, honey, peanut butter, cream cheese, vegetable oil, and Stew Leonard’s plain fat-free yogurt. Bubba Biscuit Bites: Baked with rolled oats, brown rice flour, organic beef broth, unsweetened apple sauce, sweet potatoes, cheddar cheese and local eggs. Refrigerate or freeze after opening. Made with Gluten Free ingredients. Bubba Biscuits are available at all five Stew Leonard’s locations. The entire line of Bubba’s Barkree products is available exclusively at Stew Leonard’s in Danbury, Conn.
Stew Leonard’s, a family-owned and operated fresh food store founded in 1969, has five stores in Norwalk, Danbury, and Newington, Conn. and in Farmingdale & Yonkers, N.Y. A sixth store is planned to open in East Meadow, N.Y. in mid-2017. Stew’s earned its nickname, the “Disneyland of Dairy Stores” because of its country-fair atmosphere, with costumed characters and animated entertainment throughout the store that keep children entertained while parents shop. Stew Leonard’s legion of loyal shoppers is largely due to the stores’ passionate approach to customer service: “Rule #1 — The Customer is Always Right”; Rule #2 – If the Customer is Ever Wrong, Re-Read Rule #1.” This principle is so essential to the foundation of the company that it is etched in a three-ton granite rock at each store’s entrance. The company’s culture is built around an acronym for S.T.E.W. : Satisfy the customer; Teamwork gets it done; Excellence makes it better; WOW makes it fun. For more information, visit Stew Leonard’s website at www.stewleonards.com.